Oh my, Wild Blueberry Pie! 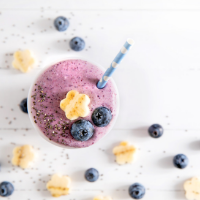 Add the frozen Wild blueberries, banana, cinnamon, and 1/2 a cup of plain Greek yogurt to the blender container, and blend until smooth. Place the graham cracker sheet in a zip lock bag, and crush with the back of a spoon. 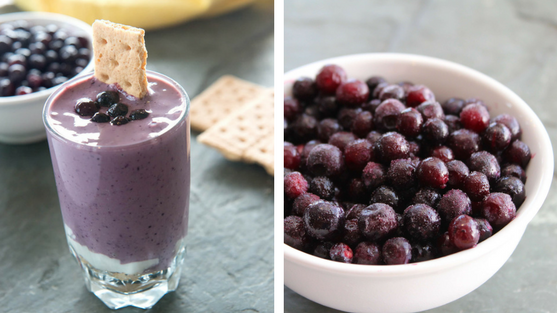 Place half of the crushed graham crackers, and a dollop of plain Greek yogurt in the bottom of a serving glass. 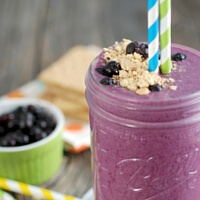 Pour the smoothie over the yogurt and graham crackers, and top with a spoonful of Greek yogurt, the remaining graham crackers, and a few leftover Wild Blueberries.